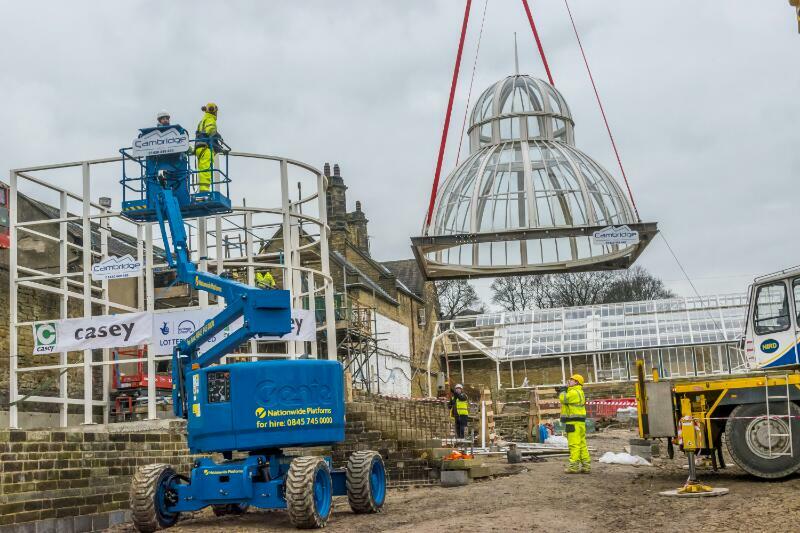 Cliffe Castle Park in Keighley is being restored with funds from the Heritage Lottery Fund. 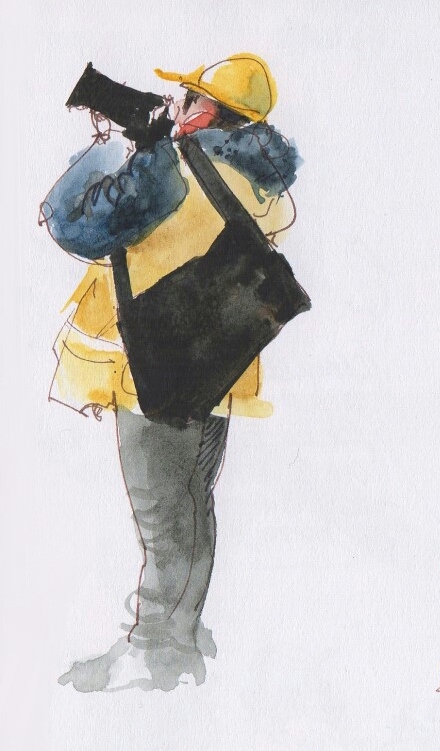 Work started on site back in June 2016 and I’m following progress and sketching whenever I can. 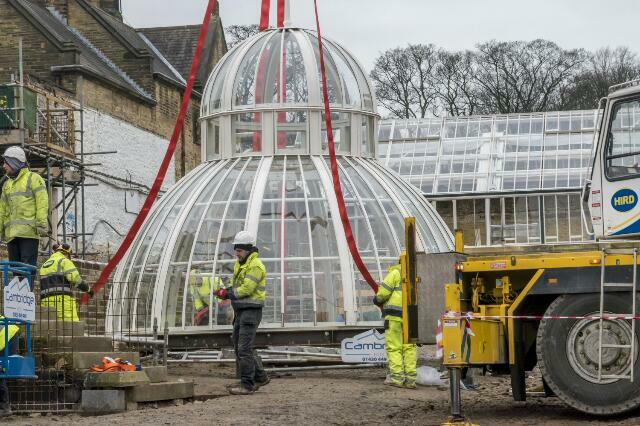 At 16 minutes past 11.00 on Thursday 9th February – an extremely chilly morning and a red-letter day in the calendar of the restoration project – the dome was raised into position on the top of the glasshouses. No fanfares, no brass band, no speeches – but a great sense of accomplishment and perhaps a little relief that the whole thing went off without the slightest hitch. 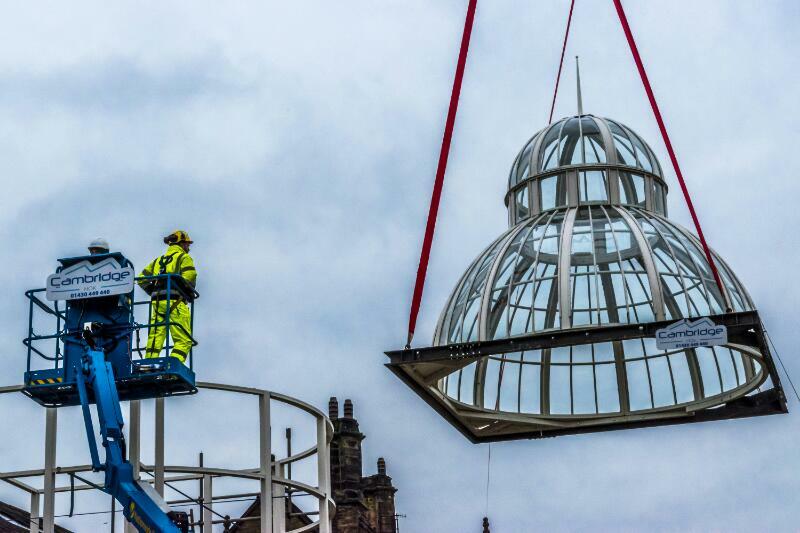 The 9.5 ton dome was lifted by a crane so immense I couldn’t get even half of it onto the page of my sketchbook, and I watched with excitement as it sailed upwards and was guided smoothly and expertly into place. I wish I could have sketched the whole process from start to finish as it unfolded but the truth is I couldn’t decide whether I should try to do that, or take photos, or video the actual moment of lifting, and stupidly I should have spent more time paying attention and looking closely at what was going on. Besides, I knew I could rely on my friend Christina Helliwell who was there taking photos to get great shots – and of course she did. So with her permission, here are some of the highlights that I couldn’t draw, as captured expertly through her lens. Fitting the hoists. 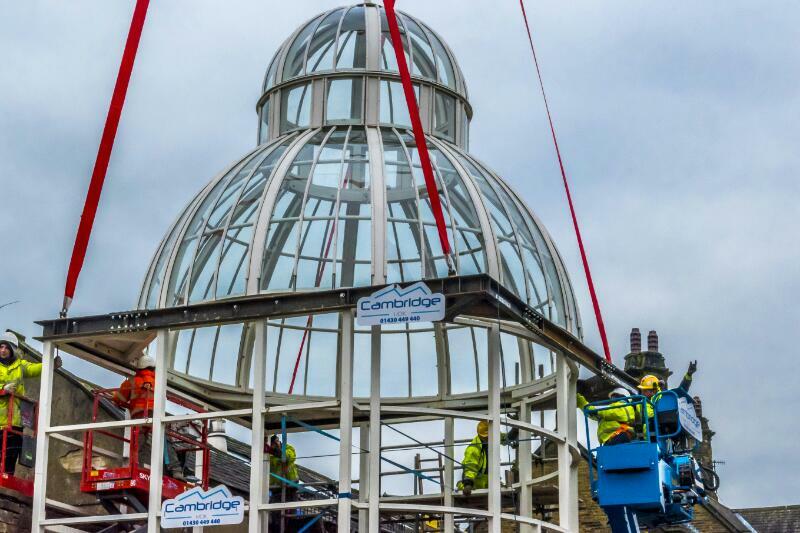 The dome has been nestled firmly into a square frame of steel girders to support it safely. Bright red hoisting straps are fitted to the frame (a nice touch, these red straps – probably brightly coloured to be clearly visible but they look very celebratory). Final adjustments, and it’s in position! 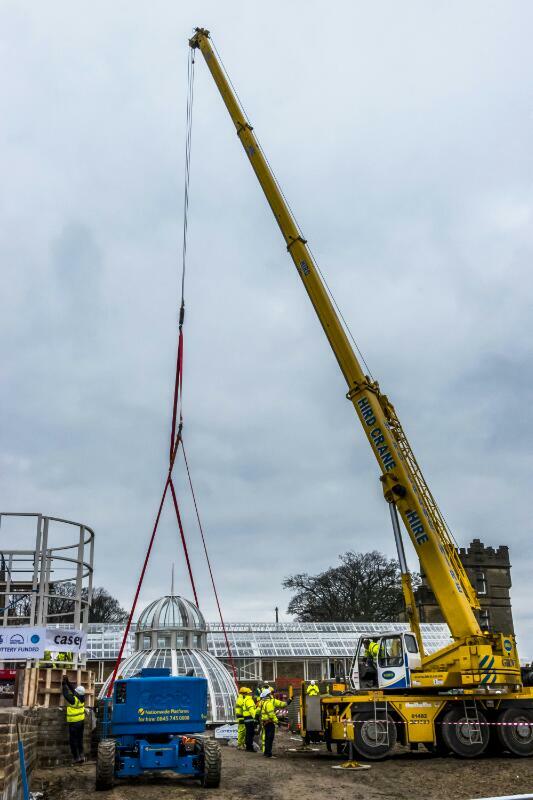 So it’s up – and now clearly visible from many parts of the park, and even from the Skipton Road. A new part of the landscape, a milestone in the progress of the project and a hint of what’s yet to come. 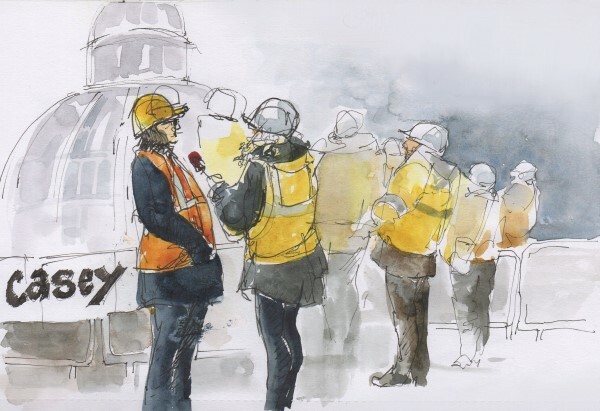 To celebrate the raising of the dome I’m making a selection of my sketches available to buy as prints, from Photobox.com. (You can see these collages here on my website.) If you’d like to know more, get in touch through my Contact page and I’ll send you a link to the album and the password you’ll need to access it. The fee you’d pay to order is simply the cost of the prints from Photobox.